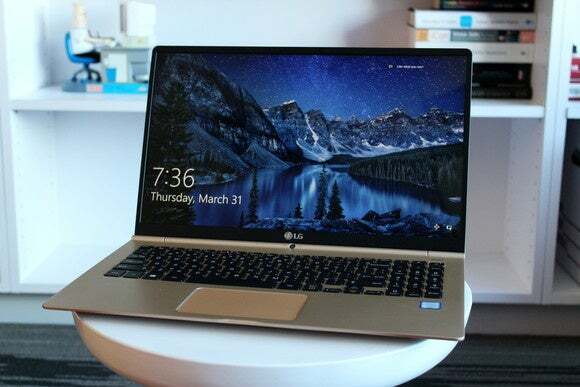 This large ultrabook offers ample workspace while being shockingly lightweight and ideal for travel. The LG Gram 15 is astoundingly light. While many rival 15.6-inch laptops tip the scales at 4 pounds or more, this featherweight ultrabook weighs just under 2.2 pounds. It’s an absolute delight to hold. When balanced on two hands, the Gram 15 feels like almost nothing. And because of this lack of heft, you can easily use it while walking, cart it around on your back for very long periods of time, and breeze through TSA security lines without the usual awkward juggling of gear and luggage. 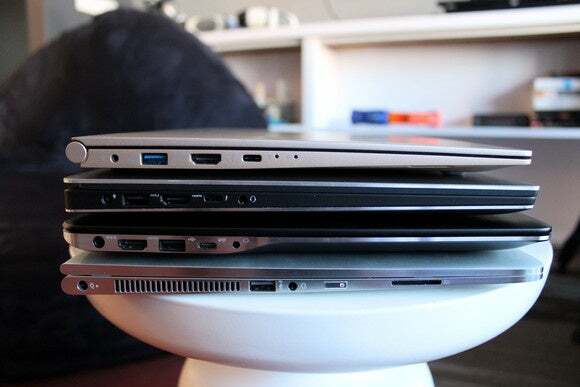 Finding a 15.6-inch laptop that travels more handily would be difficult. Especially since the base model’s asking price ($1,100 MSRP and available on Amazon) keeps the Gram 15 right in line with its closest competition. The LG Gram 15 starts at $1,100, with an upgraded version available for $1,500. Oh, the real estate you get with this laptop. Being an ultraportable fan typically means sacrificing screen size for fewer pounds in your bag, but not with the Gram 15. Though its 1920x1080 display isn’t as high-resolution as you might find in other 15.6-inch laptops, it is IPS, so it offers nice colors and a very good range of viewing angles. It also has a fairly narrow bezel—5.5mm at each side and just a hair over 8mm at the top. Despite the size of its screen, the Gram 15 is still quite compact. 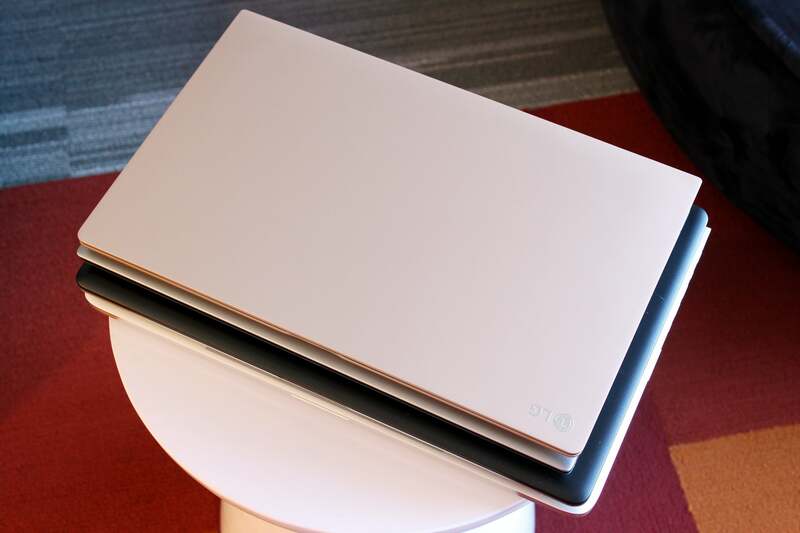 Measuring 14.08 x 8.99 x 0.66 inches, it has very similar dimensions to Dell’s XPS 15 but is almost half the weight. The LG Gram 15 (on top) has a very nice assortment of ports, including a USB Type-C for charging and data transfer. LG didn’t skimp on ports, either: On the left are a barrel-style charging port, a USB 3.0 Type A port, full-size HDMI, and a USB Type-C port that supports charging and USB 3.1 5Gbps speeds. Note that the charging pin for the standard charging port is pretty slender, so it has a higher risk of breaking if yanked on while inserted. On the right side of the machine is a Kensington lock slot, a USB Type A 2.0 port, a USB Type A 3.0 port, microSD card slot, and headset jack. There’s also a 720p webcam placed in the hinge of the laptop, which results in awkward close-ups of your fingers if you need to type during a video call. The LG Gram 15 is impressive, but it’s not perfect. Picking up the LG Gram 15 for the first time can be as unnerving as it is astonishing. The same materials that make its body so amazingly weightless—LG skipped aluminum in favor of magnesium alloys—also give it a hollow feel. While my review unit survived a multi-day, cross-country trip without incident, those who are harder on their gear might not be able to shake the sensation that you’ll break this laptop if you look at it the wrong way. The screen could be brighter, too. It tops out at about 300 nits, so though the Gram 15 is pleasant to use indoors, the display can’t compete with bright sunlight. Most disappointing are the Gram 15’s keyboard and trackpad. The keyboard is tolerable, with adequate travel and decently sized keys, but it feels mushy and stiff. Its layout also requires some learning before touch typing becomes natural, thanks to the inclusion of a narrow 10-key number pad. 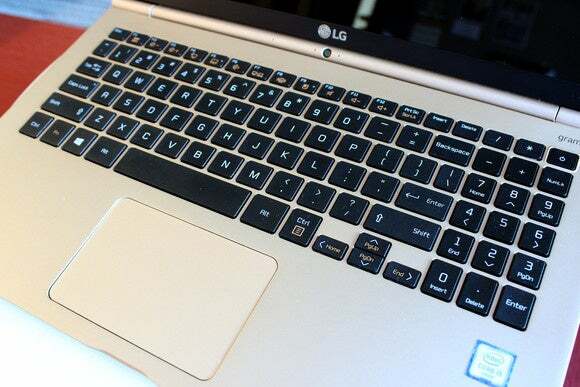 On a laptop that seems designed for frequent travel, it’s a shame that LG didn’t provide a keyboard that would be enjoyable to use. Dragging down the LG Gram 15’s experience is its mediocre keyboard and subpar trackpad. You do get a dedicated 10-key number pad, though. The piano-hinge style trackpad, on the other hand, is borderline unpleasant. It feels hollow, and clicking near the top requires a surprising amount of force. Added to these qualities are imprecise multi-touch gestures, and tracking that’s often too sensitive at faster cursor speeds. If you’re not a trackpad fan to begin with, you’ll find relief by using a Bluetooth mouse whenever possible, but some folks may decide that this design is a deal-breaker. 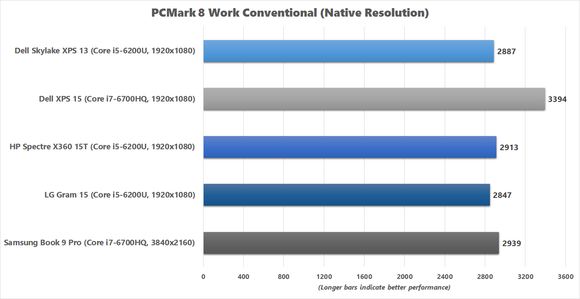 Unlike other extremely lightweight laptops I’ve used in the past, the LG Gram 15 handled itself nicely in our benchmarks. Our review unit ran Windows 10 Home and came equipped with a 2.3GHz Intel Core i5-6200 Skylake processor, 8GB of DDR3L/1600 RAM, a 256GB SSD, and an Intel Dual Band Wireless-AC7265 combo 802.11ac/Bluetooth 4.0 card. This base unit has an MSRP of $1,100, but you can opt for an upgraded version with a 2.5GHz Core i7-6500U processor and a 512GB SSD for $1,500. In PCMark 8’s Work Conventional test, which simulates basic office tasks like word processing, spreadsheet data entry, video conferencing, and basic web browsing, the Gram 15 posted a score of 2,847. Actual use affirmed its responsiveness—everything from YouTube and local video playback to light photo editing felt snappy. 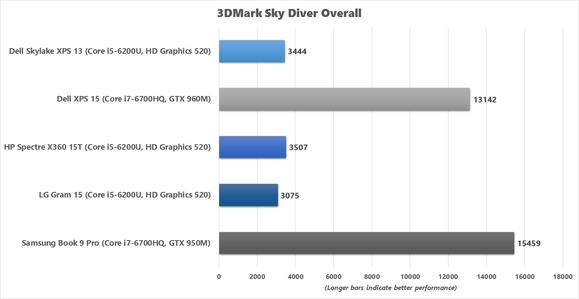 The Gram 15 also performed roughly as expected for running off integrated graphics on a Skylake chip. You can’t play Fallout 4 or The Division on this laptop, but it’s really meant for office work and perhaps some indie games or ancient AAA games, and it handles all that well. Still, the Gram 15 does falter a bit in more intensive tasks. The Dell XPS 15 and Samsung Book 9 Pro with their quad-cores and discrete graphics of course eat the dual-cores for lunch, but both also cost and weigh more. More noteworthy is how the Gram 15 stacks up against similar ultrabooks in the 3DMark tests, as well as in multithreaded performance. 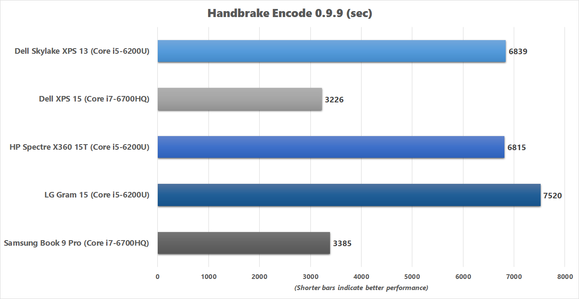 In our Handbrake 0.9.9 test, during which we encode a 30GB 1080p MKV file into a much smaller MP4 file using the default Android Tablet setting, the Gram 15 was slower than the HP Spectre X360 15T and Dell’s 2016 XPS 13 by about 12 minutes. 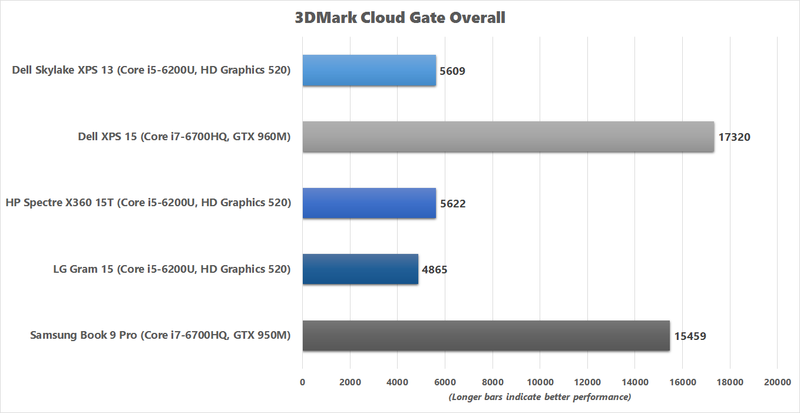 All three laptops use the same dual-core Skylake chip, and I didn’t see any indicators of throttled performance due to processor temperature, so the likely culprit of this consistent 15 percent to 16 percent drop in gaming and encoding performance is the Gram 15’s single-channel RAM configuration. Both the X360 15T and the XPS 13 utilize two sets of RAM to take advantage of the bandwidth boost you get from a dual-channel configuration. 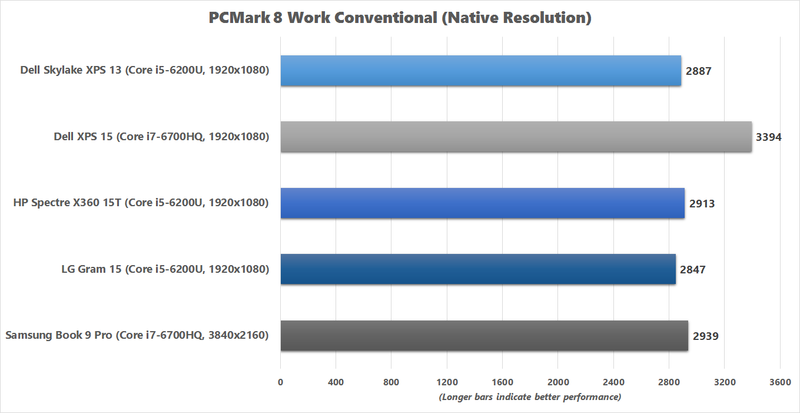 The Core i7 version of the Gram 15 will also likely show this same reduction in performance, as its official specs list just one piece of DDR3L/1600MHz RAM, too. 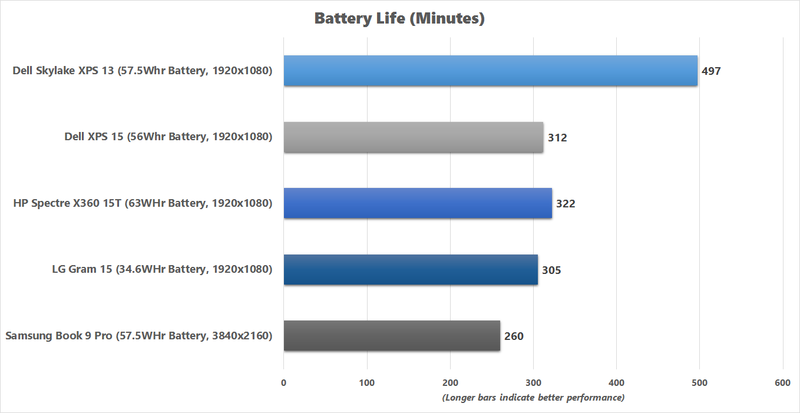 Surprisingly, the LG Gram 15’s battery life holds up fairly well relative to its competition. In our rundown test, during which we play a 4K Ultra HD file on repeat in Windows 10’s native video player, the Gram 15 lasted just over 5 hours on a 34.6-watt-hour battery. That’s nothing special in a real-world, “I’m on a transatlantic flight and need to finish this presentation by the time I land” context, of course. But only the Spectre X360 15T outdoes its 15.6-inch rivals. For example, the XPS 15 and its hungrier quad-core part lasts just 7 minutes longer than the Gram 15. Both the X360 15T and the XPS 15 weigh twice as much as the Gram 15, too. Speaking of batteries and charging: As mentioned earlier, the LG Gram 15’s USB-C port supports charging, but due to varying styles of implementation across manufacturers, not all chargers work interchangeably. A third-party charger by Innergie and the Google Chromebook Pixel’s charger both provided juice, but the HP Spectre X2’s charger did not. You can read more on why universal USB-C charging isn’t yet perfect here. 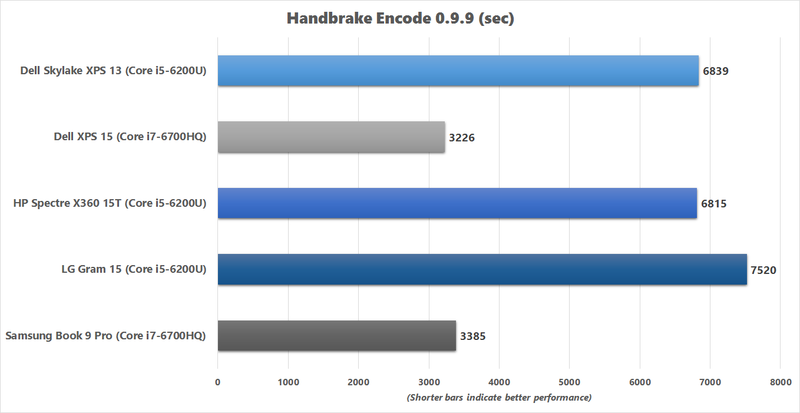 Capping off the benchmarks are a slightly above-average sequential Q32 read speed and a slightly below-average write speed for a SATA 6Gbps solid state drive: 540MBps and 304MBps, respectively. In day-to-day use, performance feels fairly zippy. From the looks of simultaneous wonder and doubt I saw on the faces of coworkers and friends over the course of testing the LG Gram 15 for this review, I’m expecting many people to bypass it in favor of smaller or heavier competitors. And I think that’s a shame. Yes, if weight doesn’t matter a lot to you, you could get an ultrabook that offered a better keyboard and vastly superior trackpad. Any machine heavier than the Gram 15 would feel denser and thus sturdier, too. But I travel like a backpacker, despite my slothful ways and general fear of the outdoors. Weight is everything to me. No other ultraportable I’ve owned has ever remotely matched the LG Gram 15’s mix of performance, larger screen size, and low weight. My 12.1-inch Dell Latitude X200—a laptop that I adored, and still keep around because I can’t bear to recycle it—had a Pentium III processor that was already slow when it launched. My Asus Eee PC netbook suffered from a severely underpowered first-gen Atom processor and a small, low-resolution screen. And my current travel machine, a original Surface Pro with a type cover, feels cramped whenever I work on a spreadsheet. The LG Gram 15 is lighter than every single one of those machines. When piled together with similar ultrabooks, you’d never guess just how light the LG Gram 15 is—but you’ll feel the difference as soon as you start traveling. A better trackpad and keyboard would have made the Gram 15 a hands-down win, despite the shortcomings of its screen. Besides being an easy travel companion, it has no bloatware preinstalled—just a very small handful of unintrusive LG applications meant to improve the experience, like a program for blue-light filtering. That said, manufacturers don’t often cater to those of us who consider each ounce that goes into our bags. Nothing like the Gram 15 has existed before, and I think it’s very uncertain whether an improved version of it will in the future. Machines like this are incredibly rare. This is as good as an extremely ultraportable gets for now—though if Samsung’s 15-inch Notebook 9 is an indication, perhaps there’s a slim chance of even better times ahead. The LG Gram 15 isn't perfect, but diehard ultraportable fans currently won't find any alternatives that rival its combination of low weight, large screen, and performance.